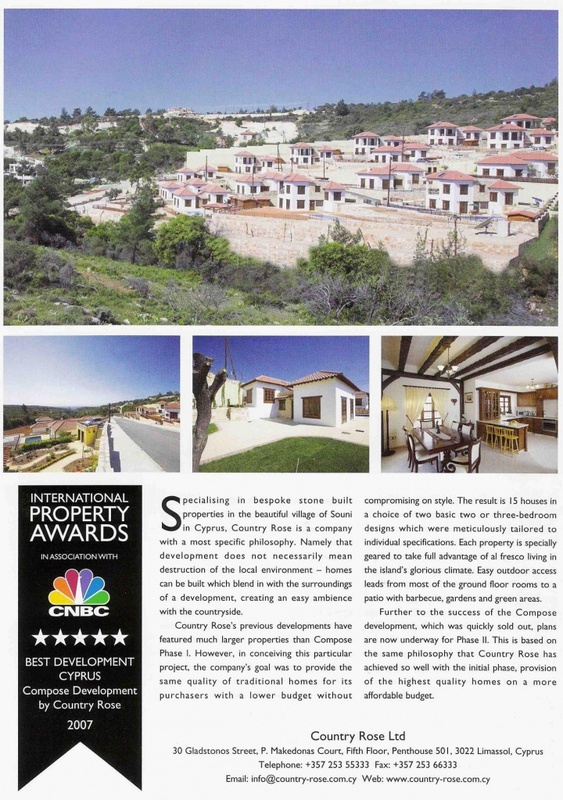 Country Rose Limited is pleased to announce another international recognition of the highest quality homes we build. On 14th of September 2007 Anna Agapiou, Sales and Marketing Executive, attended the International Property Awards 2007 at the Marriott Hotel, Grosvenor Square in London and it was with great pleasure that she accepted the award for Best Development in Cyprus on behalf of Country Rose Limited. The successful Compose development was assessed according to four criteria, namely: Location; Appearance and Finish; Safety and Innovation and Marketing by a panel of 26 judges comprising some of the top names in the property industry. The five star award conferred upon Country Rose is the highest accolade possible in this class of awards and is testament to the distinctive, beautiful homes that Country Rose continues to produce.